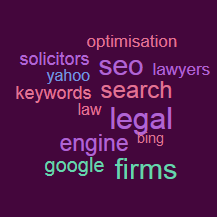 Despite the availability of modern web technology, social media and blogging platforms, there are still some law firms that have poor or, in extreme cases, non-existent brand awareness. Contrastingly, some are doing exceptionally well and winning business from well-structured web presence. I was part of a team recently pitching to a law firm to help with its online business generation activities. They had 6 other digital marketing agencies competing for the same work – and it was baffling to learn that each had proposed a completely different way they would help with the firm’s SEO. Perhaps it shouldn’t have been so baffling given the amount of misinformation presented on the web on this subject too. 7. Last but certainly not least, keep your firm’s website and blog updated with high quality legal/practical content – content really is king. Today, 1000+ words per landing page of really useful content well-structured and shared with your social networks will work wonders. If you have a tip you’d like to share or even a question you’d like to ask, please do get in touch below or on Twitter. WardBlawg is run by Gavin Ward, Operations Director with law firm websites experts Moore Legal Technology, delivering a first-class online business generation service to law firms across the UK. Contact Gavin Ward for further information. Previous post: Twitter is down – Head to Linkedin and Quora Instead?